At Trovus we have decided to focus on the behaviour changes around corporate Web 2.0 adoption, rather than the technologies. That’s not to say we don’t think that technology is important, just that there are plenty of Microsoft, IBM and Open Source technology consultancies out there who do Web 2.0 implementation. We see a gap in the market around the accompanying behaviour and cultural changes that need to take place. It’s always great to see some support of your strategy from the likes of Forrester and the other analysts. 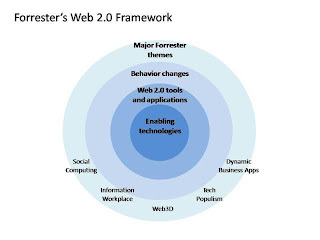 Here is Forrester’s new Web 2.0 Framework. They clearly see behaviour changes as an essential role in Web 2.0 sitting ‘above’ the technology, tools and applications. For me, this is one of the most important elements of corporate Web 2.0 adoption. The technology has become surprisingly simple, the barriers to adoption are not security or compliance with corporate directories or IT infrastructure, but rather a) whether the business can see any value in the tools and b) whether or not people will actually use them. Whether your technical preference is Microsoft, IBM, Google, Open Source or whatever you will still have to address this adoption issue. This entry was posted in behaviour, Web 2.0, Web 2.0 behaviour. Bookmark the permalink.